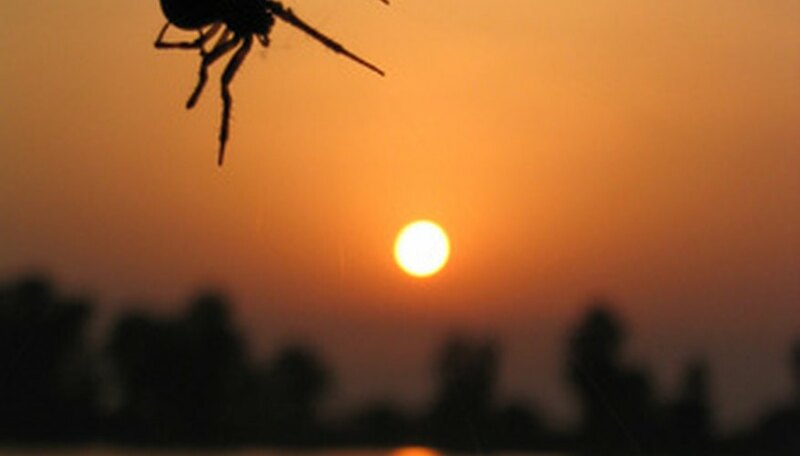 Arkansas is home to an assortment of insects and arthropods. According to the University of Arkansas Division of Agriculture website, creatures such as the striped bark scorpion, giant redheaded centipede and southeastern grass leafhopper are native to the state. In addition, there are many spiders in Arkansas that have a fierce appearance but are harmless when left alone. The Arkansas chocolate tarantula (Aphonopelma hentzi) is one of the easternmost members of the tarantula family. The females are the larger of the sexes, with some as long as 2 inches; the males average a half inch less in length. The chocolate part of the name comes from the brown color of the legs and the body. The tarantula hibernates in the winter and emerges from its burrow in spring. The Arkansas chocolate tarantula is a nocturnal hunter, laying in wait for passing insects such as crickets, grasshoppers and caterpillars. Tarantulas live for a long time, with some females living in captivity up to 25 years. Arkansas has two kinds of trapdoor spiders, Ummidia audouini and Ummidia carabivora, both of which reside in underground burrows lined with their silk. The woodland ravines of the state are often the home of these spiders. The spider gets its name from an inch-wide collection of silk, dirt and plant matter that it weaves into a sort of hinged door above its burrow. The spider holds the door up, waits for prey to come along, grabs it and retreats into its burrow as the door closes behind it. While the female trapdoor spiders stay close to home, the males move about in the summer, looking for a suitable mate. The bold jumping spider (Phidippus audax) hunts in the daylight, using its excellent vision to locate victims. The species is quite hairy and stout in appearance, but most are only around a half inch in length. The bold jumping spider, equipped with three separate rows of eyes, watches for insects and then leaps onto the unsuspecting bug, killing it and then eating it. This is a very beneficial spider throughout its range because it destroys many types of crop pests like the boll weevil and the cucumber beetle. Most are black in color and possess a white or red spot on their upper abdomen, along with two smaller spots in the rear. The spider exists in habitats such as gardens, fields, grasslands and open woodlands. Lindell, John. "Common Spiders of Arkansas." Sciencing, https://sciencing.com/common-spiders-arkansas-6153060.html. 03 August 2018.